Tomorrow morning, hopefully in the sunshine forecast to follow all the rain we’ve had, DH and I will be busy loading up our trusty little campervan for our autumn trip to the north coast of Scotland. We’ll be up there for a month, long enough to celebrate DH’s sixty-fifth birthday in the place where we celebrated mine this spring, but returning south in plenty of time for Christmas. I typed that last bit with difficulty, furiously crossing my fingers as I did so, in the hope that winter won’t arrive quite as early as it did last year and again trap us there for longer than anticipated. To give you a flavour of what it is that takes us so far at an unpromising time of the year, here are a few glimpses of the north coast at the tail end of the year. 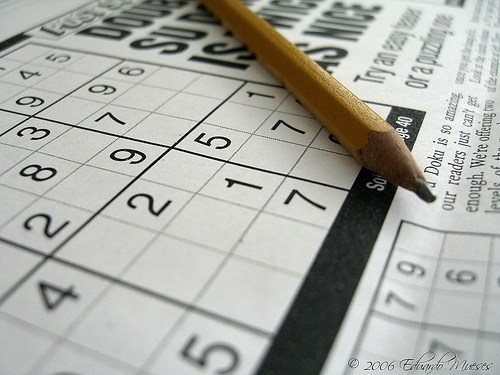 My name is Perpetua and I am a Sudoku addict. It all started so innocently one winter’s evening up in the north of Scotland. I had always resisted the temptation to try my hand at the puzzle which so enthralled some of my friends, but this evening I’d finished my book, we have no TV there, I just wasn’t in the mood to cast on that second sock and so I picked up a pencil and tried my hand at the ‘easy’ Sudoku in that day’s paper. Let me say at the outset that I don’t have a puzzler’s temperament. I’m useless at crosswords, especially the cryptic kind, and have never had the patience to learn the puzzles which fill the odd corners of the average newspaper. I’ve always been a reader, or a knitter, and so I thought I could just dip my toe into the pool marked Sudoku and take it out again with no harm done. Little did I know what would follow from that first careless attempt. To my satisfaction I did manage to finish that initial puzzle, but it was several days before I felt like trying another. But gradually the intervals between attempts grew shorter, until I realised that unless we changed our habits and began to buy a paper every day, I’d need to find another source of supply. I know Sudoku can be played electronically – on the computer or on a little handheld screen, such as Grandson #1 enjoys using, but I’m a paper and pencil girl to my core. Then I discovered that you can buy books of Sudoku puzzles, some of which even include a dinky propelling pencil with a built-in eraser. That was the moment when the attraction became an addiction. Now while waiting at the airport or the station or even at the dentist's, my bag contains not only my current paperback, but my Sudoku book and pencil. No longer do I groan when the plane, bus or train is delayed, because it gives me time to fit in just one more puzzle. In the mornings I’m as likely to do a puzzle with my morning cup of tea as open a book, since I’d have to put the book down sooner or later, whereas the puzzle will only take a few minutes. I’m still an avid reader and a keen knitter, but I’m also hooked on the satisfaction I feel when I manage to solve a particularly fiendish puzzle, especially when I can do it with as few written notes as possible. I think of it as exercise for the brain, which, given my advancing years, is as important as exercise for the body, or at least that’s my excuse. Now where did I put that pencil? What is it about Prague? Since my return I’ve been pondering just why Prague has so captured my heart and my imagination during my two relatively short visits. It doesn’t have for me the special religious and spiritual attraction of Assisi, though I have found worshipping at Saint Clement’s deeply satisfying. Neither does it have the profound personal significance of Oxford, where I studied and grew up and fell in love. Yet Prague shares many of the characteristics which make both Oxford and Assisi so unforgettable. It is ancient and historic and quite extraordinarily beautiful. Its most significant buildings have somehow survived the ravages of time, natural disaster and human conflict and neglect and today, skilfully preserved or restored, they provide a memorable illustration of a thousand years of architectural innovation and genius. Like Assisi and Oxford, Prague has an importance which stretches far beyond national boundaries, as is shown by the visitors from every part of the world who throng its historic streets. However, unlike them Prague is a capital city, the seat of government for a nation now making its way in the modern world after the isolation and stagnation of almost half a century of communist rule. Though its beauty and sense of history are a big part of what fascinates me about Prague, another factor is that it is a city on a human scale. Despite being far larger than Assisi or even Oxford, its historic centre still lends itself to being explored comfortably and pleasurably on foot and alone. It divides very neatly into four main areas – the Old Town, the New Town, the Jewish Quarter and, across the Charles Bridge, the Little Quarter (Mala Strana) and Prague Castle. Each of these has its own distinct personality and a plethora of sites to visit and admire. In addition, if you want to venture beyond the main tourist haunts, Prague makes it easy by being the proud possessor of an extremely efficient and cheap integrated public transport system. Even a country bumpkin like me had no difficulty whatever in hopping on and off the very regular and frequent trams, buses and metro trains to get to wherever I wanted to go. With their aid and armed with comfortable shoes and a good city guide and map, the whole of Prague is your easily opened oyster. But Prague is more than simply its historic buildings, however beautiful and numerous they are. It is also a wonderfully green city, full of tree-lined streets and squares, and with a wide variety of lovely parks and public gardens, large and small. This makes it surprisingly easy to move from bustling, crowded streets to find oneself almost or even totally alone in a green space or a tiny, winding lane. And when you are tired of discovering the streets and buildings or strolling through the parks, you can explore the superb art-galleries and museums, or go to one of the many concerts which are such a feature of Prague life, or simply sit with a coffee or some great (and cheap) Czech beer and watch the world go by. Anyone who reads my blog is likely to have spotted that I am a country girl at heart. I have visited a fair number of cities and lived in a couple for short periods when I was young, but I could never imagine myself actually living happily in a city until I visited Prague. If any city could change this country mouse into a town mouse, it would be Prague. I don’t think it will happen, but it’s interesting to realise that the little nugget of potential is there. After an interestingly rollercoaster landing at Heathrow yesterday, thanks to the strong and gusty wind, I’m back on home ground with my mind absolutely buzzing with new impressions and happy memories. Just give me time to unpack, do the washing and download the new photos and I’ll try to make sense of it all and begin to share it with you. Until then a few more images of this wonderful city of Prague.